As nice as the user-interface is, what I really like about Cryptocompare is its API, which provides programmatic access to a wealth of crypto-related data. It is possible to drill down and extract information from individual exchanges, and even to take aggregated price feeds from all the exchanges that Cryptocompare is plugged into – and there are quite a few! When it comes to interacting with Cryptocompare’s API, there are already some nice Python libraries that take care of most of the heavy lifting for us. For this post, I decided to use a library called cryptocompare . Check it out on Git Hub here. You can install the current stable release by doing pip install cryptocompare , but I installed the latest development version direct from Git Hub, as only that version had support for minutely price history at the time of writing. Now that we’ve got our library of API functions, let’s take a look at what we can do with Cryptocompare! At the time of writing, this returned a list of 2,609 coins! By comparison, there are around 2,800 stocks listed on the New York Stock Exchange. Let’s focus on the biggest players in crypto-world: the coins with the largest market capitalisation. We can get price data for a list of coins using the function cryptocompare.get_price() and if we specify full=True , the API will return a whole bunch of data for each coin in the list, including last traded price, 24-hour volume, number of coins in circulation, and of course market capitalisation. Cryptocompare’s API will only allow us to pass it a list of coins that contains no more than 300 characters at any one time. To get around that limitation, we’ll pass lists of 50 coins at a time, until we’ve passed our entire list of all available coins. The API returns a json string, which we can interpret as a dictionary in Python. Note that the outer-most keys in the resulting dictionary are 'RAW' and 'DISPLAY' which hold the raw data and data formatted for better displaying respectively. In our case, we prefer to work with the raw data, so we’ll keep it and discard the rest. Wouldn’t we expect that honour to go to Bitcoin, with symbol BTC? And what about all those other coins that you’ve probably never heard of? What’s going on here? It turns out that Cryptocompare includes data for coins that haven’t yet gone to ICO, and it appears that in such cases, the market capitalisation calculation is done using the pre-ICO price of the coin, and its total possible supply of coins. And we can access the data for any coin in the dictionary by doing df_dict[coin] where coin is the symbol of the coin we interested in, such as ‘BTC’. Now that we have our data, we can do some fun stuff! 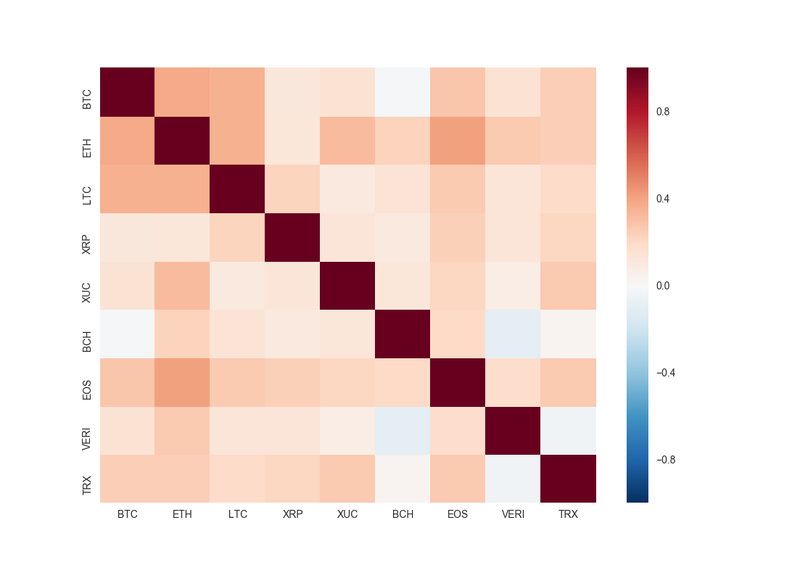 Value of BTC and other major coins traded through the biggest exchanges over time – which exchanges are dominating? 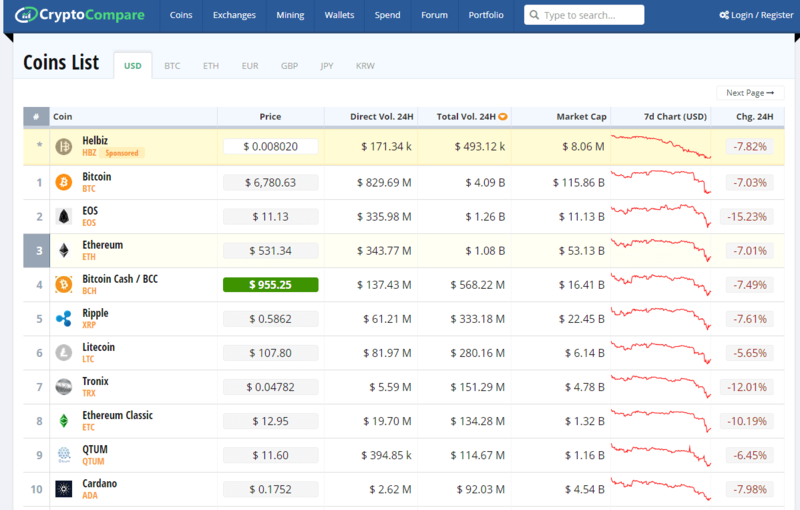 Top coins traded by fiat currency – do some fiats gravitate towards certain cryptocurrencies? Are prices significantly different at the same time across exchanges – that is, are arbitrage opportunities present?1Of course, there are a host of implementation and execution challenges to overcome to realise arbitrage opportunities, but identifying their existence is the first step. In this post, I introduced the Cryptocompare API and some convenient Python tools for interacting with it. I also alluded to the depth and breadth of data available: over 2,000 coins, some going back several years, broken down by exchange and even counter-currency. 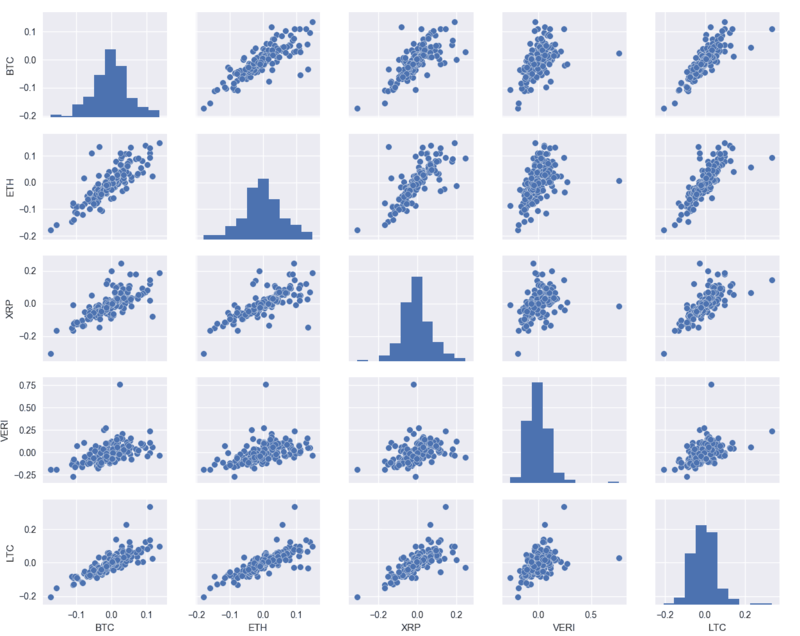 I also showed you some convenient base-Python and pandas data structures for managing and interrogating all that data. In future blog posts, we’ll use this data to backtest some crypto trading strategies. *Data is the basis of everything we do as quant traders. Inside the Robot Wealth community, we show our members how to use this and other data for trading systems research in a way that goes much deeper than the basics we touched on here. But data is just one of the many algorithmic trading fundamentals we cover inside Class to Quant. Not only are our members improving their trading performance with our beginner to advanced courses, but together they’re building functioning strategies inside our community as part of our Algo Laboratory projects. If you’re interested and want to find out more, try Class to Quant for 30 days risk free. I’d love to meet you inside. We'll also send free training and relevant promos. No spam. Unsubscribe anytime.